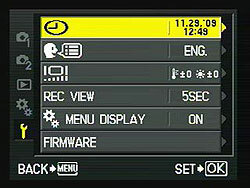 Program AE (Program Shift): This mode places the camera in control over both aperture and shutter speed, while the user has access to all other menu functions. Turning either dial cycles through a range of equivalent exposure settings, enabling the Program Shift mode. Shutter Priority: The opposite of Aperture Priority, this mode allows the user to set the shutter speed, from 1/4,000 to 60 seconds, while the camera selects the most appropriate aperture setting. Manual: Provides complete user control over the exposure, including both aperture and shutter speed settings. 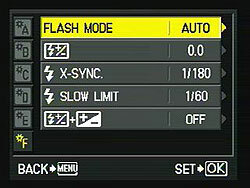 A Bulb shutter setting also becomes available in this mode, allowing variable length exposures for as long as you hold down the shutter button. Movie Mode: Used for shooting HD (1280x720) or SD (640x480) movies at 30 frames per second with stereo sound. A menu allows Program, Aperture Priority or Manual modes to be used, as well as the one of the eight available Art Filters. A few of the art filters reduce the capture frame rate, causing the video to appear sped up when played back. The Diorama art filter is particularly strongly affected, and hence audio recording is disabled when using this filter. 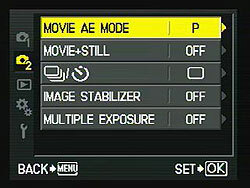 Scene Mode: This mode provides access to the 19 preset shooting modes via a scene menu. Scene modes available are: Portrait, e-Portrait, Landscape, Landscape + Portrait, Sport, Night Scene, Night + Portrait, Children, High Key, Low Key, DIS Mode, Macro, Nature Macro, Candle, Sunset, Documents, Panorama, Fireworks, and Beach & Snow. Art Filters: This mode accesses the eight available Art Filter modes: Pop Art, Soft Focus, Pale & Light Color, Light Tone, Grainy Film, Pin Hole, Diorama and Cross Process. As in movie-mode, frame rate can be adversely impacted when using art filters, and the diorama effect in particular causes a very slow refresh rate for live view. Intelligent Auto: This mode gives the camera control over most exposure variables: The E-P2 analyses the scene and automatically selects from Portrait, Landscape, Night Scene, Sport, and Macro exposure modes. The user can still adjust image resolution / compression, aspect ratio, drive mode, image stabilizer, focus mode / point, and flash mode. Playback Mode: The Playback button on the rear panel accesses Playback mode, where you can review captured images. The left and right arrow keys scroll forward and backward one image at a time, while the up and down keys scroll ten images at a time. You can enlarge captured images or display them in an index format for quick viewing. Erases images from the memory card or formats the card. You can register two sets of custom settings, or reset to factory defaults (Reset option). 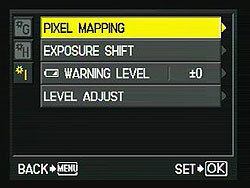 If an exposure shift or level adjust values are set, they will not be reset by the custom reset function. 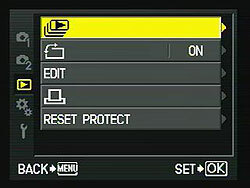 Select a preset for specific situations, or manually adjust each preset. New i-Enhance preset identifies the main subject in a scene, then boosts brightness and saturation for just areas of the image which comprise that subject, to help draw your attention to it. Effect is only available for i-Enhance and Custom modes. B&W Filter and Pict. Tone are only available for Monotone mode. Custom mode allows one of the other modes to be duplicated, and combined with a specific gradation level. Adjusts overall brightness for higher or lower contrast. Select the image size and quality, and the movie mode. Available options depend on the setting of Quality Set option in Custom menu G. Options listed here are defaults. Sets the still image aspect ratio. Shows the sizes of RAW, Large, Middle, and Small JPEGs. Raw files are always 4:3 aspect, regardless of this setting. Sets the exposure mode in movie mode. Programmed, Aperture Priority, Manual, or one of the eight Art Filters can be used. Automatically takes a full-resolution still when movie recording is stopped. I.S. 1 stabilizes in both directions. I.S. 2 stabilizes in vertical plane, I.S. 3 stabilizes in the horizontal plane. Capture multiple exposures, or overlay existing RAW shot. Slideshows of stills (and movies) with optional background music. Edit still images. You cannot edit movies. 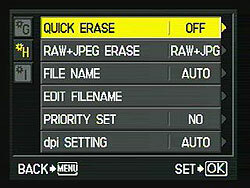 Selecting a RAW image creates a JPEG copy for editing. Overlays multiple images, to create a single new image. Only works with Raw files, and the output image is saved as a JPEG or a Raw+ Large/Normal JPEG, depending on whether Still Picture Quality in Record Menu 1 is set to JPEG or Raw. Each source image can have its brightness adjusted from 0.1 to 2.0x individually. Marks single or all frames for printing. Cancels all write protection marks. Sets the autofocus mode in both still capture and Movie mode. Modes are Single, Continuous, Manual, Single with Manual adjust, and Continuous with Tracking. All automatically selects one of the AF areas. Determines how next AF point is selected when at the edge of the array. Loop wraps around to the exact opposite side of the display. Spiral also jumps to the adjacent column when moving vertically, or the adjacent row when moving horizontally. Applies only for the AF selection screen that's accessible from the Live Control and Super Control Panel screens -- not the one that's accessed through the Custom menu. Resets focus to infinity when camera turns off. Enables focusing during Bulb exposures. Controls the direction of focus ring. Enables automatic magnification during manual focus. Controls the function of the dials. Any option can be applied to Main and Sub dial. Swap behavior of dials while navigating menus. - Dial 2 is opposite. Controls the function of the Shutter and AEL/AFL buttons in each AF mode. Off setting locks exposure only while button is held down. Assigns a function to the Fn button. You can change the function of the left arrow button in Record mode. Lets you register settings for My Mode. Sets how long a button's function displays after a quick press. You can swap the functions of the AE L and Fn buttons. Disables the 4-way controller to prevent unintended operation or lets it select AF point. If enabled, the camera will release the shutter before AF function is complete. Selects which format to use for high definition video output, and whether to enable or disable HDMI CEC control of the camera using the TV's remote. Selects which format to use for standard-definion video output. Turns the camera's beep sounds on or off. Sets the camera to go to sleep after a period of inactivity. If on, boosts the LCD brightness. If on, detects faces in the frame and sets focus for those faces. Information displayed when the INFO button is pressed. Display camera roll and pitch. Set to On to record audio with movies. Sets the exposure compensation increment. Sets the exposure metering mode. Controls the type of metering performed via the AEL/AFL button. Sets the ISO EV step size. 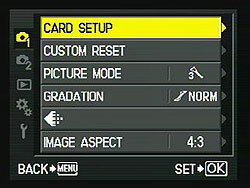 Sets a shooting mode that automatically enables Auto ISO. Sets the maximum time for the Bulb exposure. Select the interval between pressing the shutter button and releasing the shutter. White Balance bracketing. Selectable for both Amber-Blue and Green-Magenta directions. Sets shutter sync speed for external flash firing. Sets the lower shutter limit for the Slow Sync flash modes. Flash EV Comp. + EV Comp. If on, flash EV comp. will be added to overall EV comp. and flash intensity control. Long exposure noise reduction (dark frame subtraction). Noise reduction processing setting. Higher values recommended for high ISO. AEL/AFL button can capture a preview shot to confirm the white balance accuracy. In All Set, you can apply the same WB compensation values to all WB modes at once. AEL/AFL button can capture a preview shot to confirm the white balance accuracy. Enables a shading compensation that attempts to eliminate vignetting with certain lenses. 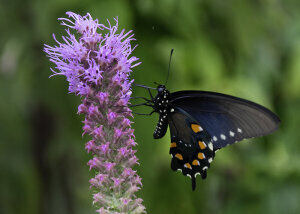 Doesn't work when using a teleconverter or extension tube, and may boost noise levels towards the edge of the image. You can combine three image sizes and four compression ratios and register those settings. Set the pixel size for the Middle and Small options. If on, allows you to immediately erase an image during post-capture display. Designates how JPEG+RAW files are erased. Auto continues file numbering to new cards while Reset starts from 0. You can change the 2-digit file name prefix. 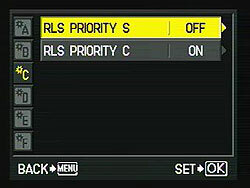 Sets the priority of cursor display for Erase screen to No or Yes. Lets you set the resolution for printing images. Enables a self-check of the sensor, and remaps bad pixels. Each metering mode can be "fine-tuned" between -1 and +1 EV in 1/6 EV steps. Note that resetting the camera does not clear these values. Battery warning level can be tweaked from the default, in arbitrary units. You can calibrate the level gauge ("zero" it out). Note that resetting the camera does not clear this value. Sets the camera's clock and calendar. Sets the menu language. Options available varies with region. You can download additional options with the included software. Adjusts LCD brightness and color response. Controls a post-capture display and the display time. Auto setting displays image then switches to Playback mode for quick deletion. Enables display of the Custom Menu.